The liver secretes about a liter of bile a day. It is secreted at the pressure of 20 cm. of water and if the pressure within the biliary system rises because of obstruction, the secretion of the bile will cease at the level of about 35 cm. of water. In addition to its pigment, bile contains bile salts as conjugates, hormones, such as thyroxine and steroids, electrolytes and lipids. Bile salts are able to increase the flow of bile and the hormone secretion has a similar effect. Hepatic pile is stored in the gall bladder. Gall-bladder bile differs from the hepatic variety in being concentrated ten times or so by contraction under the action of the hormone which is released from the upper bowel into blood stream. A fatty meal provides the stimulus for the release of the above hormone. Cholecystitis is an acute inflammation of the gall-bladder which is usually associated with the presence of gall-stones particularly where these produce obstruction of the cystic duct. On rare occasions, the disease may occur without stone formation and then it seems likely that a previously abnormal bladder is the site of blood stream embolization by pathogenic bacteria, particularly Esch coli. The sudden attack gives pain which is referred to the right of scapula. Though more often colicky, it is a steady pain accompanied by nausea, retching and pyrexia. The patient lies still and seeks relief from a hot water bottle. Radiation of pain to the chest or the left side of the abdomen may cause diagnostic confusion with myocardial infarction and left basal pneumonia. Slight icterus may be present, if bile-duct obstruction has taken place by gall-stones. Increasing toxaemia, swinging temperature and the presence of empyema of the gall-bladder. It perforation, lives abscess, pancreatitis do not appear, recovery is favourable ,unless there is a recurrence of attacks. This has to be made from acute appendicitis, acute pancreatitis, renal colic and pleurisy by noting that in cholecystitis, there is sudden high fever with marked tenderness in the gall-bladder area, high leucocytosis, moderate degree of jaundice with raised bilirubin in urine. The complications include Perforation and gangrene of the gall-bladder and empyema, jaundice and hepatomegaly. Complete rest in bed ,hot fomentation is advised. Diet should be milk and fat-free. Veratrum Viride. General congestion anywhere: lungs, liver, gall-bladder. Bryonia. The gall-bladder is swollen and congested. It has stitching pains, worse from motion. Kali Carb. Stitches in the region of liver better by motion. Solitary stones composed of cholesterol and largely radio-translucent. Bilirubin stones, found particularly where there is increased haemolysis and also radio-translucent. Mixed stones, consisting of calcium, bile pigments and cholesterol, which are often radio-opaque. Cholecystitis, i.e. infection of the gall-bladder, is the main cause. Bile consists of cholesterol salts and fatty acids. During infection, bile salts are more rapidly absorbed by the gall-bladder, and hence cholesterol, having precipitated, contributes towards the formation of stone. The bacteria, Esch. Coli, Salm. Typhi, Streptococci or staphylococci, when spreads from gastritis, duodenites, typhoid fever, sore-mouth and throat, are responsible for this infection. The infective agent usually disappears after stones have form in combination with mucous, pus and tissues. The concentration of bile is increased during advanced pregnancy, when there is an increased quantity of cholesterol in bile. Hence this is a predisposing causes for the formation of stone. When the rate of emptying bile from the gall bladder is relatively slow, there is stagnation of bile, leading to concentration of the bile Fluid. The concentration bile is sufficiently irritating and favors inflammation, and finally prepares ground for infection and consequent formation of gall stones. Over eating, particularly of fats, by person having obesity and sedentary habits, is another predisposing cause for the formation of stone after having an excess of cholesterol in the gall bladder. During the profound dissolution of disease, such as, pernicious anaemia, black water fever, and jaundice, a large amount of bile pigment (bilirubin) is liberated. The pigment has a tendency to form bilirubin stones in the gall bladder and the gall-ducts. Excruciating spasmodic pain (biliary colic) in the right hypochondrium and epigastrium, radiation down to navel, back towards spine, upwards into the chest, to the shoulder blades, and in some case even down the arm to the very finger ends. In nervous person, hiccough, convulsion, fainting and speechlessness is observed. Sunken face, sunken eyes, pointed nose. Jaundice, as long as the stone obstruct the biliary ducts. The slightest touch increase pain. Tenderness over the gall bladder; liver often moderately enlarged. Perforation of gall bladder, or the biliary duct into the peritoneum, or the intestine. Cancer may follow in a few cases. The pain is to be distinguished from the pain of peptic ulcer, hiatus hernia, or gastric cancer, renal and other intestinal or pancreatic colics and sometimes choronary thrombosis, which has a characteristic electro-cardiogram. Persistent and recurring jaundice with pain, and enlargement of liver is uaually due to the presence of stone in the gall bladder without colic, cancer or liver, or of pancreas or cirrhosis of liver. The exact diagnosis is difficult. Berberis Vulgaris. Stitching pains in the region of gall bladder, shooting up to stomach, constipation, yellow complexion; an important remedy in gall stone and biliary colic. Boldoa fragrant. Cholecystitis and biliary calculus; bitter taste, no appetite, constipation. Calcarea Carb. 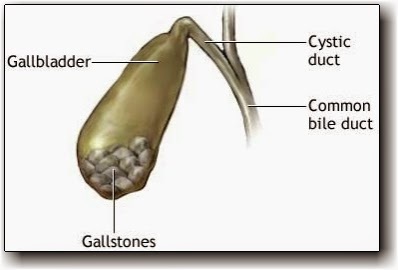 Gall stone colic; distention with hardness partial sweats; cold damp hands and feet. Carduus Marianus. Gallstone colic, to be used in tincture; special medication for this remedy is the presence of liver spots; another indication is a dark brown patch over the lower part of the breast. Chelidonium. The remedy causes liver to secrete thinner and profuse bile and help in the expulsion of gallstone and prevent their formation. The liver symptoms are very prominent. Stitching pains in the liver region; and pain under the angle of the right shoulder blade are characteristic symptoms. Chionanthus. Highly recommended for biliary calculi. Jaundice and hepatic pains are its indications. It qualifies bile, prevent the formation of stones and expel those already formed. The directions are: sluggish circulation, sick headache, coated tongue, nausea, and complete loss of appetite. Cinchona. It thins bile and prevents the formation of stones; sensitive to touch, pain relieve by bending double. Usually give china 6X (twice daily) for five days. After this give, such doses on alternate days, then every 3rd day, 4th day, 5th day, and so on till there is a gap on one month. Dioscorea. Almost a specific for gall stone colic to be given in tincture (20 to 40 drops in oz. of water, a tea spoonful every half an hour) pain about umbilical region, continuous and constant paroxysms of great intensity, relieved by stretching the body and bending backwards. Fel. Tauri. Liquifies bile; obstruction of gall duct; biliary colic; jaundice. Hydrastis. Bitter taste; chronic torpor of bowels, lack of appetite, coated tongue, yellow urine, gall stone colic ( to be used in mother tincture). Cholesterinum 3X. jaundice gall stones; burning pair in right side; when walkinf the patient puts his hand on the right hypochondrium, as motion hurts him. Fabiana imbricate. (pichi) useful in cholelithiasis and liver affections in tincture doses excoriating urine and calculi. Other useful remedies are; Ether, Atropine sulph 3X. Symptomatic Homeopathy medicines helps for Gall Bladder problems. Its good to consult the doctor to get symptomatic treatment.